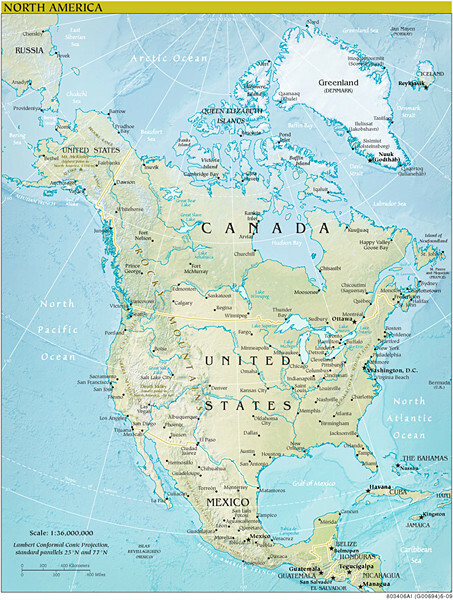 North America covers an area of about 24,709,000 square kilometers. 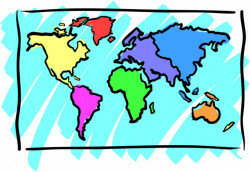 The North American continent includes many different countries. Antigua and Barbuda's prehistoric peoples had no written language. The Bahamas' capital is Nassau. Barbados currently maintains Queen Elizabeth II as head of state. Canada's common border with the United States to the south and northwest is the longest in the world. Some Canadians speak English, some speak French. The Canadian land area makes it the world's second largest country by total area. Costa Rica literally translates as "Rich Coast". Havana is the largest city in Cuba. Dominica has been nicknamed the "Nature Isle of the Caribbean" for its seemingly unspoiled natural beauty. Both by area and population, the Dominican Republic is the second largest Caribbean nation (after Cuba). In 2001 El Salvador dropped its own currency, the colón, and adopted the U.S. dollar. The national bird of Grenada is the critically endangered Grenada Dove. Guatemala's capital is Guatemala City. Honduras was formerly known as Spanish Honduras to differentiate it from British Honduras (now Belize). Jamaica is the third most populous anglophone country in the Americas, after the United States and Canada. Mexico is the fifth-largest country in the Americas by total area. Falling within the tropics, Nicaragua sits between 11 degrees and 14 degrees north of the Equator in the Northern Hemisphere. Panama's capital is Panama City. Saint Kitts and Nevis are geographically part of the Leeward Islands. Saint Lucia has a legal system based on British common law. Saint Vincent and the Grenadines has an estimated population of 120,000. Trinidad and Tobago obtained independence in 1962. The United States of America is one of the world's most ethnically diverse and multicultural nations.